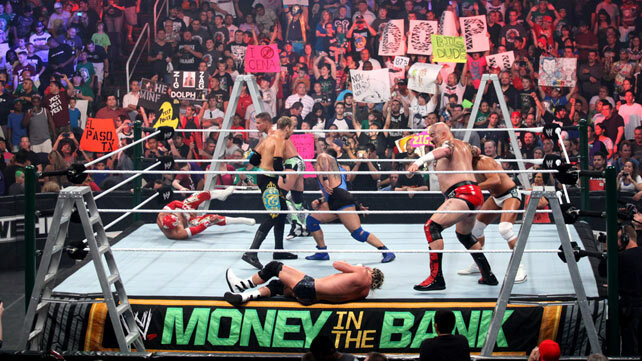 The Ladder Match. Maybe the most dangerous match in all of wrestling. A championship belt is raised 15 ft above the ring. The only way to retrieve it is climb to the top of a ladder and unhook it. The first man to do so wins the championship. Before you grab the belt you can use the ladders around the ring as weapons and launching pads for insane aerial assaults. Bringing a ladder into a wrestling ring would seem impossible to a 50s wrestling fan. Not today. Our generation has become accustomed to the impossible evolving into the possible. So much so in fact, the word “impossible” does not carry the same meaning. When someone says something is impossible, we really think they mean it is impossible*. So when I say it is impossible to reach heaven and gain salvation on your own, you may roll your eyes at me. But saving yourself from sin is something utterly unattainable. It is a prize hanging high above us, unreachable on our own. We need something else to reach the prize of salvation. We need a boost. We need a ladder. In Genesis 28, Jacob has dreams of a ladder uniting the secular with the spiritual. He envisions a ladder from the earth to heaven with the angels of God moving up and down upon it. God doesn’t pick his metaphors lightly. He uses a ladder to speak to Jacob for a reason. You don’t grab a ladder unless you need one. Humans are a do-it-yourself type of people. If something is beyond our grasp we simply stretch our toes or grab a few boxes to stand on and try to grab the big gold belt for ourselves. But no matter what we do the prize of salvation is just beyond our reach. Getting into heaven from where we are on earth is impossible. As in never will it ever be possible under any scenario to save ourselves because of our sin. If we can’t reach something on our own, we need a ladder. God and God alone must bridge the gap between the secular and the spiritual. When Christ died and rose from the dead, He took the punishment for every crime ever committed, for every guilty feeling and selfish choice. He laid down His life and was raised up as a ladder to help those He loved reach salvation. You can stop trying to reach God on your tiptoes. You can stop stacking boxes to get to the prize above your head. You can stop trying to prove yourself by winning a ladder match on your own. Thanks to Christ the impossible has become possible. Wake up from your reality into the dream of salvation come true. Put away your pride. Climb the ladder and grab the prize. Have you ever disregarded the ladder of Christ and tried to grab the prize of salvation on your own?